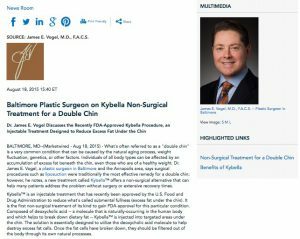 Dr. James E. Vogel discusses the recently FDA-approved Kybella procedure, an injectable treatment designed to reduce excess fat under the chin. Baltimore, MD – What’s often referred to as a “double chin” is a very common condition that can be caused by the natural aging process, weight fluctuation, genetics, or other factors. Individuals of all body types can be affected by an accumulation of excess fat beneath the chin, even those who are of a healthy weight. Dr. James E. Vogel, a plastic surgeon in Baltimore and the Annapolis area, says surgical procedures such as liposuction were traditionally the most effective remedy for a double chin; however, he notes, a new treatment called Kybella™ offers a non-surgical alternative that can help many patients address the problem without surgery or extensive recovery times. Kybella™ is an injectable treatment that has recently been approved by the U.S. Food and Drug Administration to reduce what’s called submental fullness (excess fat under the chin). It is the first non-surgical treatment of its kind to gain FDA approval for this particular condition. Composed of deoxycholic acid – a molecule that is naturally-occurring in the human body and which helps to break down dietary fat – Kybella™ is injected into targeted areas under the chin. The solution is essentially designed to utilize the deoxycholic acid molecule to help destroy excess fat cells. Once the fat cells have broken down, they should be filtered out of the body through its own natural processes. While Kybella™ can be an ideal solution for patients who have excess fat that is contributing to the appearance of a double chin, Dr. Vogel says those who are primarily affected by loose skin rather than fat under the chin may not be candidates for the procedure; however, an alternative can be recommended in those cases. Dr. Vogel says the best way for individuals to determine whether they are candidates for Kybella™ is to schedule a consultation with a board-certified plastic surgeon who can evaluate their needs and answer their questions. He says Kybella™ can be considered a revolutionary treatment, offering patients a convenient, non-surgical way to effectively address the appearance of a double chin and achieve beautifully enhanced facial contours. Dr. James E. Vogel is certified by the American Board of Plastic Surgery. Dr. Vogel is a member of the American Society of Plastic Surgeons, the American Society for Aesthetic Plastic Surgery, the Johns Hopkins Medical Society, the International Society of Hair Restoration Surgery, and other organizations. In addition to heading his private plastic surgery practice in the Baltimore area, Dr. Vogel is an Associate Professor in the Division of Plastic Surgery at the Johns Hopkins School of Medicine. He has also been recognized as a Top Doc in Baltimore Magazine. At his practice, Dr. Vogel offers a full range of cosmetic surgery procedures, as well as non-surgical aesthetic enhancement options and advanced hair restoration treatments. Dr. Vogel is available for interview upon request.